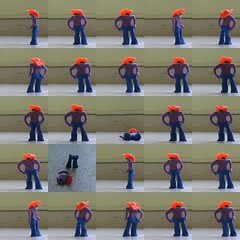 Production Stills :: Brokeback Claymation – I say. Essay. Assay. ऐसे. Uploaded on Flickr by rahulrazdan. This is sheriff BarClay, the lead character of my attempted film "Brokeback Claymation". Initially meant to be clay-animated, the development of this character threw up many engineering challenges. It has been wire-reinforced. His wearing bell-bottomed denims was not as per initial design, but evolved more out of the need to keep his centre-of-gravity within his footfall area. However, if you see in the (attempted) film, even this did not work as per design.